A manual for irate customers. A crowded United Airlines flight was cancelled. A single agent was re-booking a long line of inconvenienced travellers. The agent replied, “I’m sorry, sir. I’ll be happy to try to help you, but I’ve got to help these folks first; and then I’m sure we’ll be able to work something out. Without hesitating, the agent smiled and grabbed her public address microphone. “May I have your attention, please?” she began, her voice heard clearly throughout the terminal. “We have a passenger here at Gate 14 who does not know who he is. If anyone can help him with his identity, please come to Gate 14″. Or how to make your point in a smart and funny way, and the anecdote went all over the Web. In this era of the World Wide Web and social media, the advertising business has to deal with a new and unpredictable factor: the (evermore) critical public. ‘Generation Internet’ thinks faster and has the capacity and the tools to be critical about almost everything. It is a tough crowd that zooms in on mistakes, and is harsh to the brand when no adequate response or just no response at all is given. And social media is thé tool for frustrated or just angry customers. When running a business you know that hell hath no fury like an angry customer. This creates more buzz than positive posts, tweets… and you don’t want things to escalate. A critical audience keeps your company alert and if you handle the complaints in a good way, it generates rather positive attention. In one word, yes. 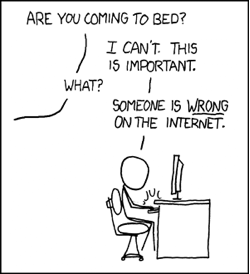 You may want to crawl in a dark hole, far away, but ignoring the comments won’t make them go away. It’s necessary to be open, transparent and approachable as a company. A two-way dialogue is the key element, especially when you’re dealing with a, softly said, impolite customer. You also better respond quickly, as companies are often judged on the immediacy in which they’re able to handle a complaint. Providing your complainers with a quick answer shows confidence, openness and honesty in your communication. To make sure you don’t miss a thing that’s been said about you, it is very important to check your social platforms, blog, e-mail… every day! So, how, exactly, should I respond? Even if you want to go on a tirade, you shouldn’t. Type it out, write everything you want to say, let it all out. Then print it and show it to your spouse. And then burn it. You are now ready to write a proper response! When you react to negative feedback, it’s important to always write a public response, this on the same platform that you received the complaint. If someone tweets that your brand name is weird, posting a message on Facebook explaining the name’s origin isn’t going to be very effective. However, if it’s an issue that you think needs more personal attention, invite the person to speak offline. Another option: If you have a customer service department, consider dedicating one of your social platforms to a place where customers can log their complaints. This way, all the feedback is gathered on one place while showing that your brand efficiently handles their issues. Allright. Now, what should I say? Before you craft your reply, consider where the comment is coming from. Is it a legitimate customer complaint—or just a jab from someone who’s being a jerk? Your response strategy should be different for the two. There are 4 magic words: “thank you”, and “I’m sorry”. If you genuinely apologise and admit your mistake, your issue becomes a non-issue and you offer your customers a way to contact you directly. Your messaging should be genuine, concise, and consistent with the way you talk about your brand. But no matter what, don’t forget to be human. If you saw these two responses to a negative comment pop up on a company’s blog, which would you think handled the situation better? Thank you for your comment. At XYZ brand, we continue to look for ways to elevate the products and services we provide you, and we appreciate any opportunity to hear from our customers. We will take this into consideration moving forward. Hi, Bob. Thanks for getting in touch and sorry to hear about the long wait you had at our store the other day! If you send along your email to help@xyz.com, we’ll find a way to make it up to you. Let them know in a personal way, that their voice has been heard. 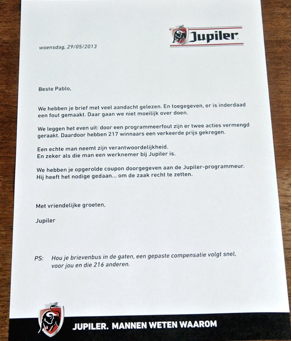 If you have a laidback, informal brand voice, you might be able to effectively make a joke about it, like Jupiler did. 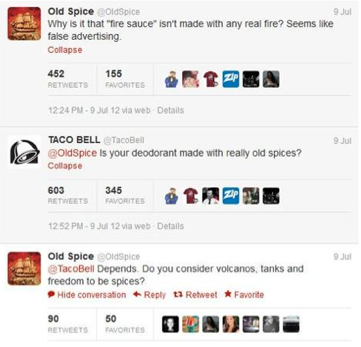 If your brand is more serious, say you appreciate the feedback and are always looking for ways to improve. Can I ever censor or delete nasty comments? If someone leaves a really heinous comment (and I’ll let you decide the definition of “heinous”), you not only have the right to ignore it, you have the right to delete it. Unless someone has posted something really horrendous, you want to invite people to have an open dialogue on your platform. Deleting comments can be worse for your reputation than the comments themselves. And remember that anything that happens on your public platforms can generate media attention! Think and rethink about what you post! No matter how you turn it, everybody makes mistakes. But you can stand out in the way you solve them. And, let’s not forget that recognizing and rewarding customers’ online positivity is also an effective way to create valuable social buzz. Besides that, interactivity and co-creation are key elements in social media. Take a look at the Old Spice campaign. It is a good example of using social media to listen to your customers and respond in a witty way that attracts everybody’s attention. And besides these hilarious video responses to tweets, they even managed to figure out the mathematics about advertising! And even in times of total despair, remember these wise words op H.G. Wells: “The crisis of yesterday is the joke of tomorrow.” Fun guaranteed!